..... Click the link for more information. having the properties of that element. ..... Click the link for more information. that are found in orbits around the nucleus. ..... Click the link for more information. , of the same element. transfer of heat or electricity through a substance, resulting from a difference in temperature between different parts of the substance, in the case of heat, or from a difference in electric potential, in the case of electricity. The electrons are often described as revolving about the nucleus as the planets revolve about the sun. This picture, however, is misleading. The quantum theory has shown that all particles in motion also have certain wave properties. For a particle the size of an electron, these properties are of considerable importance. As a result the electrons in an atom cannot be pictured as localized in space, but rather should be viewed as smeared out over the entire orbit so that they form a cloud of charge. The electron clouds around the nucleus represent regions in which the electrons are most likely to be found. The shapes of these clouds can be very complex, in marked contrast to the simple elliptical orbits of planets. Surprisingly, the sizes of all atoms are comparable, in spite of the large differences in the number of electrons they contain. The atomic number of an atom is simply the number of protons in its nucleus. The atomic weight of an atom is given in most cases by the mass number of the atom, equal to the total number of protons and neutrons combined. An atom may be conveniently symbolized by its chemical symbol with the atomic number and mass number written as subscript and superscript, respectively. For example, the symbol for uranium is U (atomic number 92); the isotopes of uranium with atomic weights 235 and 238 are indicated by 23592U and 23892U. in chemistry, the statement that when two or more elements form more than one compound, the ratio of the weights of one element that combine with a given weight of another element in the different compounds is a ratio of small whole numbers. ..... Click the link for more information. , which gives a relation between the weights of two elements that combine to form different compounds. ..... Click the link for more information. , devised simultaneously by Dmitri Mendeleev and J. L. Meyer, which arranged atoms of different elements in order of increasing atomic weight so that elements with similar chemical properties fell into groups. By the end of the 19th cent. it was generally accepted that matter is composed of atoms that combine to form molecules. change in the velocity of a body with respect to time. Since velocity is a vector quantity, involving both magnitude and direction, acceleration is also a vector. In order to produce an acceleration, a force must be applied to the body. ..... Click the link for more information. ), and all accelerated charges radiate electromagnetic energy. Thus, they should lose their energy and spiral into the nucleus. , in mechanics, the quantity of motion of a body, specifically the product of the mass of the body and its velocity. Momentum is a vector quantity; i.e., it has both a magnitude and a direction, the direction being the same as that of the velocity vector. ..... Click the link for more information. of light emitted being proportional to the energy difference between the orbits. ..... Click the link for more information. in 1932 the modern picture of the atom was complete. , elementary particle heavier than an electron but lighter than other particles having nonzero rest mass. The name muon is derived from mu meson, the former name of the particle. The muon was first observed in cosmic rays by Carl D.
See G. Gamow, The Atom and Its Nucleus (1961); H. A. Boorse and L. Motz, ed., The World of the Atom (2 vol., 1966); B. H. Bransden and C. J. Joachain, Physics of Atoms and Molecules (1986). The smallest part of a chemical element that can retain its chemical identity, i.e. can take part in a chemical reaction without being destroyed. An atom can however be transformed into one or more other atoms by nuclear reactions. Nearly all the mass of an atom is concentrated in the small central nucleus, which is made up of protons and neutrons. Electrons occupy the remaining space in the atom and may be thought of as orbiting the nucleus. The number of protons in a particular nucleus, i.e. the atomic number of the atom, is equal to the number of electrons in a neutral (nonionized) atom. The arrangement and behaviour of these electrons determine the interactions of the atom with other atoms and thus govern chemical properties and most physical properties of matter. See also energy level; ion; isotopes. a particle of matter of microscopic dimensions and very small mass (microparticle); the smallest part of a chemical element and the bearer of its properties. To each element there corresponds a specific type of atom denoted by the symbol for the element (for example, hydrogen, H; iron, Fe; mercury, Hg; and uranium, U). Atoms can exist both in a free state (in a gas) and in a bound state. By uniting chemically with atoms of the same element or atoms of other elements, they form more complex microparticles—molecules; the entire enormous diversity of chemical compounds is due to different combinations of atoms into molecules. In connecting to each other directly or within the structure of molecules, atoms form liquids and solids. The properties of macroscopic matter—gaseous, liquid, and solid—and the properties of individual molecules depend on the properties of the atoms which compose them. All the properties of atoms, physical and chemical, are determined by the structure of the atom as a system which consists of a nucleus and electrons; the properties obey quantum laws, which are characteristic of microscopic phenomena. Modern representations of the structure and properties of atoms are given below. General nature of atomic structure. The atom consists of a heavy nucleus, which has a positive electric charge, and light electrons with negative charges that surround the nucleus, forming electron shells. The dimensions of the entire atom are determined by the dimensions of its electron shell and are large in comparison with the dimensions of the nucleus. Table 1 contains the typical orders of the dimensions. The electron shells of the atom do not have rigidly defined boundaries; the values of the dimensions more or less depend on the methods of their determination and vary greatly. CHARGE OF THE NUCLEUS. The charge of the nucleus is a basic characteristic of the atom, which determines to which specific element it belongs. The charge of the nucleus is always a whole multiple of the elementary electric charge of positive electricity e, which is equal in absolute value to the charge of the electron, –e. The charge of the nucleus is +Ze, where Z is the order number (atomic number). For the atoms of the successive elements in Mendeleev’s periodic system of elements, Z = 1,2,3,4, ...—that is, for atoms of H, He, Li, Be, .... In a neutral atom the nucleus with charge +Ze holds Z electrons with a total charge -Ze, and the complete charge of the atom is zero. In a positive ion the atom, having lost k electrons (an ionized atom), retains Z − k electrons (k = 1, 2, 3, . . .—the multiplicity of ionization) and its charge is +ke; in a negative ion the atom, having gained k electrons, has Z + k electrons, and its charge is -ke. For a positive ion the maximum value of k is Z (such an ion has lost all its electrons and consists of a “bare” nucleus), for a negative free ion, k = 1 and for bound atoms the formation of negative ions with k > 1 is possible (in solutions, complex compounds, and ion crystals). The atoms of a specific element are understood to be both neutral atoms and ions of the element. However, an atom may be understood as a neutral atom, as opposed to ions. Positive and negative ions are distinguished from neutral atoms symbolically by writing k + and k- respectively. For example, O denotes the neutral oxygen atom (Z = 8)—O+, O2+ (or O++), O3+, . . ., O8+ are its positive ions; O−, O2−, (or O−) are its negative ions. The set of the neutral atom and the ions of the other elements with the same number of electrons as the neutral atom forms an isoelectron series. The simplest such series begins with the hydrogen atom: H, He+, Li2+, Be3+, . . . ; the members of this series consist of the nuclei and one electron. The order of magnitude of the charges of the nuclei of different atoms was determined by the English physicist E. Rutherford in his pioneering experiments on the scattering of alpha particles (1911). The values of Z were reliably established by the English physicist G. Moseley (1913–14) on the basis of a study of the X-ray spectra of consecutive elements in the periodic system. The multiplicity factor of the nuclear charge of an atom to the elementary charge e received an explanation based on the representations of nuclear structure: Z is equal to the number of protons in the nucleus, the proton has the charge +e, and the total charge of the nucleus is equal to the sum of the charges of all Z protons—that is, +Ze. MASS OF THE ATOM. The atomic mass increases with the increase of Z. The mass of the atomic nucleus is approximately proportional to the mass number A—the total number of protons and neutrons in the nucleus. The mass of the electron (0.91 x 10−27 g) is considerably less (approx-mately 1,840 times) than the mass of the proton or neutron (1.67 x 10−24 g) and so the mass of the whole atom is determined mainly by the mass of its nucleus. The atoms of a given element can differ in nuclear mass (the number of protons Z is constant, the number of neutrons A — Z can vary); such different atoms of the same element are called isotopes. The difference in nuclear mass has almost no effect on the structure of their electron shells, which depends on the charge of the nucleus Z. The chemical properties and the majority of physical properties (optical, electrical, and magnetic) which are determined by the structure of the electron shells are identical or very close for all isotopes of a given element. The greatest contrasts in properties (isotopic effects) are obtained for the isotopes of hydrogen (Z = 1) because of the large differences in the masses of the ordinary light hydrogen atom (A = 1), the atom of deuterium (A = 2), and the atom of tritium (A= 3). The mass of the atom is approximately equal to the mass number A and varies from 1.67 x 10-24 g for the lightest atom of hydrogen (primary isotope: Z = I, A = 1) to approximately 4 x 10−22 g for the heaviest atoms of the transuranium elements (Z = 100, A= 250). The most exact values of atomic mass can be determined by the methods of mass spectroscopy. The atomic mass is not precisely equal to the sum of the nuclear mass and the mass of the electrons but is less—by the amount of the mass defect ∆M = W/c2, where W is the energy of formation of the atom from the nucleus and the electrons and c is the velocity of light. This correction is of the order of the mass of one electron me for heavy atoms; for light atoms it is negligibly small (on the order of 10−4 electron masses). THE ENERGY OF THE ATOM AND ITS QUANTIZATION. Owing to the small dimensions and large mass of the nucleus, it is possible to consider it to be approximately a point which is located at the center of mass of the atom. (The common center of mass of the nucleus and electrons is found close to the nucleus, and the velocity of the nucleus’s motion relative to the center of mass of the atom is small in comparison with the velocities of the electrons.) Correspondingly, the atom can be considered as a system in which N electrons with charge —e move around an immovable attracting center. The motion of the electrons in the atom takes place in a restricted volume—it is bounded. The total internal energy of the atom £ is equal to the sum of the kinetic energy of all the electrons T and the potential energy U—the energy of attraction of them by the nucleus and the repulsion of them by one another (the electrostatic energy of the interacting electric charges of the nucleus and the electrons, according to Coulomb’s law). depends only on the distance r of the electron from the nucleus. Graphically, the function U (r) is represented by a curve (Figure la), which decreases infinitely with the decrease of r—that is, with the approach of the electron to the nucleus. The value of U (r) at infinity is assumed to be zero. For negative values of the total energy, E = T + U < 0, the motion of the electron is restricted; it is confined in space to values r = rmax, for which T = 0 and E= l/(rmax). For positive values of the total energy, E = T + U > 0, the motion of the electron is free; it can go to infinity with energy E = T = ½mv2, which corresponds to an ionized hydrogen atom, H+. A neutral atom of hydrogen, H, represents in this manner a system which consists of a nucleus and an electron in a bound state with energy E < 0. The total internal energy E of an atom is its primary characteristic as a quantized system—a system which is subject to quantum laws. As is shown by a huge amount of experimental material (for example, the Franck-Hertz experiment), the atom can remain for long periods only in states with a specific energy—stationary (not varying in time) states. To each of these “permitted” values of energy there corresponds one or several stationary quantized states of motion. Figure 1. Energy of the hydrogen atom: a—possible values of the total energy E1, E2, E3. . . (horizontal lines) and graph of the potential energy (heavy curve; points indicate the values of rmax for E = E1, E2, E3.....); b—energy-level diagram (horizontal lines) and optical quantum transitions (vertical lines). The crosshatched region ( E > 0) corresponds to the free state of the electron. The system cannot have intermediate values of energy (that is, those which lie between E1, and E2, E2 and E3, and so on); such a system is said to have quantized energy, and the determination of the possible values of energy is called the quantization of energy. Any variation of the energy E is connected with a quantum transition (jump) of the system from one stationary quantum state to another (see below). The possible discrete atomic energy values of expression (3), by analogy with the potential energy of a body which is raised to various heights (levels), may be represented graphically in the form of an energy-level diagram, where a straight line constructed at the height Ei (i = 1, 2, 3, . . .) corresponds to each energy value; such a diagram is presented in Figure lb for the hydrogen atom. (In Figure la, for E < 0, then, only specific transitions which are connected by a horizontal dotted line with the levels in the diagram of Figure lb are possible.) The lowest level, E1, which corresponds to the lowest possible energy of the system, is called the ground state, and all remaining states (Ei > E1, i = 2, 3, 4, . . .) are excited states, because for the transition to them (transition to the corresponding stationary excited states from the stationary ground state) it is necessary to excite the system—to impart the energy of magnitude Ei − E£, to it from without. The quantization of the atom’s energy is a consequence of the wave properties of electrons. It is impossible to consider the electron in the atom as moving as a material point along a fixed trajectory according to the laws of classical mechanics. These laws are valid only for particles of large mass (mac-roparticles), but for the electron, as a microparticle, it is necessary to take into account—together with its corpuscular properties (properties of a particle)—its wave properties. According to quantum mechanics, to the motion of a microparticle of mass m with velocity v there corresponds a wavelength λ = h/mv, where h is Planck’s constant. For an electron in an atom, λ ∽ 10−8 cm—that is, the order of the linear dimensions of the atom—and the calculation of the wave properties of an electron in an atom is necessary. The bounded motion of an electron in an atom is similar to a standing wave, and it must be considered not as the motion of a material point along a trajectory, but as a complex oscillatory process. For a standing wave in a restricted volume, only specific values of wavelength λ (and, consequently, the frequency of oscillations v) are possible. Since, according to quantum mechanics, v = E/h, it follows that the system, which like an atom consists of coupled microparticles, can have only specific values of energy—that is, the energy is quantized and a discrete sequence of energy levels, a discrete energy spectrum is obtained. For a hydrogen atom, such a discrete sequence is obtained for £ < 0 (see Figure 1). Free (that is, unbounded in space) translational motion of a microparticle—for example, the motion of an electron dissociated from an atom (in the case of a hydrogen atom, an electron with energy £ > 0)—is similar to the propagation of a traveling wave in an unbounded volume, for which any values of λ (and v) are possible. The energy of such a free microparticle can take on any values (that is, is not quantized), and a continuous sequence of energy levels is obtained—a continuous energy spectrum. For the hydrogen atom such a continuous sequence, which corresponds to an ionized atom, is obtained for E > 0. The value E ∞ 0 corresponds to the ionization limit, and the difference E∞ − E1 = Elon represents the ionization energy; for the hydrogen atom it is 13.6 eV. DISTRIBUTION OF ELECTRON DENSITY. The state of an electron in an atom can be characterized by the distribution in space of its electric charge with a certain density—the electron density distribution. In this case the electrons are considered graphically as if they were spread out in space and formed an “electron cloud.” Such a model more accurately characterizes the electrons in an atom than the model of a point electron, which moves, according to the Bohr theory, along rigidly defined orbits. However, it is possible to compare specific electron density distributions with Bohr orbits. For the ground level of energy E1 the electron density is concentrated near the nucleus; for excited energy levels E2, E3, E4, . . . it is distributed over ever-increasing mean distances from the nucleus (which corresponds to the increase of size of the orbit in the Bohr theory). In a complex atom these electrons are grouped in shells which encircle the nucleus at various distances and which are characterized by specific electron density distributions. The strength of the electron bonds in more exterior shells is less than in interior ones, and the most weakly bound of all electrons are in the outermost shell, which has the greatest dimensions and which determines the dimensions of the whole atom. In the ionization of an atom it loses outer electrons; the dimensions of positive ions relative to those of a neutral atom decrease as the charge of the ion increases. Conversely, the dimensions of negative ions are greater than those of a neutral atom. CALCULATION OF ELECTRON SPIN AND NUCLEAR SPIN. In atomic theory it is very significant to consider the spin of the electron—its intrinsic (spin) angular moment, which from a graphical point of view corresponds to the rotation of the electron around its own axis (if the electron is considered as a particle of small dimensions). The magnetic moment of the electron is associated with its spin. Therefore, in the atom it is necessary to take into account not only the electrostatic interactions (see above), but also the magnetic interactions, which are determined by the magnetic spin moment and by the orbital magnetic moment connected with the motion of the electron around the nucleus; magnetic interactions are small in comparison with electrostatic. The most essential effect of spin appears in complex atoms: the filling of the electron shells of the atom by a specific number of electrons depends on the electron spin (see below). The nucleus in the atom can also have an intrinsic mechanical moment—a nuclear spin, with which a small nuclear magnetic moment is connected (hundreds or thousands of times smaller than the electron magnetic moment)—and also, in certain cases, a so-called quadrupole electric moment. This leads to additional very small interactions of the nucleus and the electrons which cause an additional splitting of atomic energy levels into a so-called hyperfine structure (small in comparison with the fine structure). Quantum states of the hydrogen atom. The most important role in the quantum theory of the atom is played by the theory of the simplest one-electron atom, which consists of a nucleus with charge +Ze and an electron with charge _e—the theory of the hydrogen atom (H) and of hydrogenlike ions He+, Li2+, Be3+, ... (an isoelectronic series; see above), generally called the theory of the hydrogen atom. By the methods of quantum mechanics it is possible to obtain the exact and complete characterization of the states of the electron in a one-electron atom. The problem of complex (multielectron) atoms is solved only approximately; in this case, the results of the solution of the problem of the one-electron atom are used as the starting point. Figure 2. Possible states of the hydrogen atom for values n: ments are shown graphically. where the constant a0 = 0.529 x 10−8cm = 0.529 Å—the radius of the first circular orbit of the hydrogen atom, which corresponds to its ground state. (This Bohr radius is often used as a convenient unit for the measurement of length in atomic physics.) The radius of the orbits is proportional to the square of the principal quantum number, n2, and inversely proportional to Z; for hydrogen-like ions the scale of linear dimensions decreases by Z times in comparison with the hydrogen atom. (4) M8Z—according to the rule M8z= (h/2π)m8—the magnetic spin quantum number m8 = 1/2; -1/2. Thus, to each atomic energy level of hydrogen there corre-spond 2, 8, 18, . . .2n2(for n = 1, 2, 3, . . .) different stationary quantum states (see Figure 2). If only one quantum state corresponds to the energy level, it is called nondegenerate, if two or more, degenerate; the number of such states g is called the degree or extent of degeneracy. (For nondegenerate energy levels, g = 1.) The energy levels of the hydrogen atom are degenerate, and their order of degeneracy is 8n = 2n2. Various electron density distributions are obtained for different states of the hydrogen atom. The distribution depends on the quantum numbers n, I, and ǀm1ǀ. In this case the electron density for s-states (l = 0) differs from zero at the center—that is, in the location of the nucleus—and does not depend on direction (it is spherically symmetrical); for the remaining states (l > 0) it is equal to zero at the center and depends on direction. The distribution of electron density for the states of the hydrogen atom is obtained by photographing a special model; the dimensions of the “electron cloud” grow approximately in proportion to n2, which corresponds to an increase of the radius of the orbit according to formula (6) in Bohr’s theory. The quantum states of the electron in hydrogen-like ions are characterized by the same four quantum numbers n, l, ml, and ms as in the hydrogen atom. The electron density distribution is preserved, but it increases by a factor of Z. The dimensions of the orbits are reduced correspondingly. 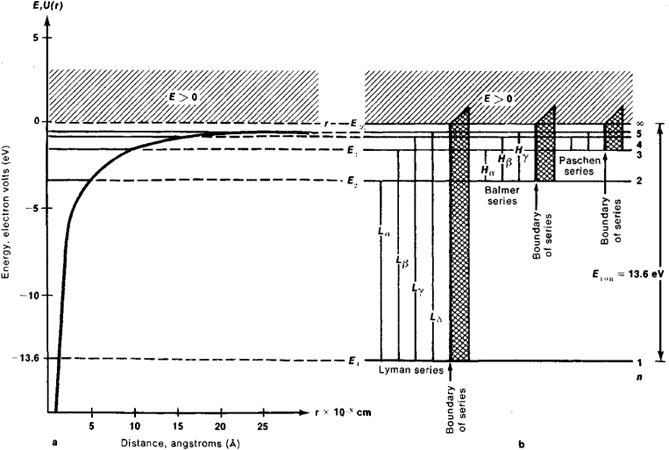 number of sublevels (see Figure 3). Splitting in an electric field (the Stark effect) and splitting in a magnetic field (the Zeeman effect) for energy levels of the hydrogen atom are both proportional to field strength. Small magnetic interactions within the atom also lead to energy-level splitting. For hydrogen atoms and hydrogenlike ions there is spin-orbital interaction, an interaction of the spin and orbital moments of the electron, which is not accounted for in the derivation of the basic formula (4); this causes the so-called fine structure of the energy levels—the splitting of excited levels En (for n > 1) into sublevels. The most accurate studies of the fine structure by the methods of radiospectroscopy have indicated the presence of a so-called level shift, which is explained in quantum electrodynamics. A hyperfine structure, which is caused by very small magnetic interactions of the nuclear spin with the electron momenta, is observed for all the energy levels of the hydrogen atom. The level E1 is split into two sublevels with a distance between them of approximately 5 x 10−6 eV. Electron shells of complex atoms. The theory of complex atoms (which contain two or more electrons) differs fundamentally from the theory of the hydrogen atom because in the complex atom there are identical particles— electrons—which interact. Mutual repulsion of electrons in a multielectron atom considerably reduces the strength of their bonds with the nucleus. For example, the separation energy of a single electron in a helium ion (He+) is equal to 54.4 eV; in the neutral helium atom, as a result of repulsion of the electrons, the separation energy of one of them is reduced to 24.6 eV. For the external electrons of the heavier atoms the reduction of bond strength as a result of repulsion by internal electrons is even more significant. An extremely important role in complex atoms is played by the properties of electrons as identical microparticles, which have spin s = ½ and for which Pauli’s exclusion principle holds true. According to this principle, there cannot be more than one electron in each quantum state in a system of electrons, which for a complex atom leads to the formation of electron shells which are filled by strictly fixed numbers of electrons. Taking into account the indistinguishableness of the interacting electrons, it is logical to speak only of the quantum states of the entire atom. However, it is possible to approximately consider the quantum states of individual electrons and characterize each of them by the set of four quantum numbers n l, ml and ms, analogous to the electron in the hydrogen atom. In this case the energy of the electron turns out to be dependent not only on n, as in the hydrogen atom, but also on l; as before, it does not depend on m, and ms. Electrons with given n and l in a complex atom have the same energy and form a specific electron shell; they are called equivalent electrons. Such electrons and the shells formed by them indicate both the quantum states and energy levels with given n and l—symbolically ns, np, nd, nf,... (for l = 0, 1, 2, 3, . . .)—and are spoken of as 2p-electrons, 3s-shells, and so on. (The number of electrons in a given shell is indicated by the index on the upper right.) Neutral atoms of the consecutive elements of the periodic system which have the same number of electrons—H, He, Li, Be, B, and C(Z = 1,2,3, 4, 5, 6)—have the same electron configurations as the ions of nitrogen. The periodicity in the properties of the elements is determined by the similarities of the external electron shells of the atom. For example, the neutral atoms of P, As, Sb, and Bi(Z = 15, 33, 51, 83) have three p-electrons apiece in the external electron shell, similar to the N atom, and are similar to it in their chemical properties and many of their physical properties. Figure 4. 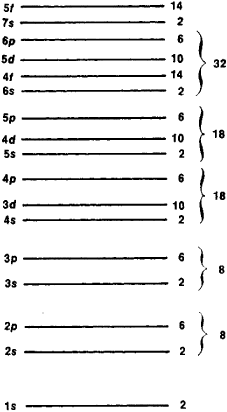 Sequence of filling of energy levels of an individual electron in a complex atom. At the right are the numbers of electrons in the filled shells. In considering the filling of electron shells, it is necessary to take into account that beginning with n = 4, electrons with smaller l but larger n are bound more strongly than electrons with larger / but smaller n —that is, 4s electrons are bound more strongly than 3d electrons. This is reflected in Figure 4, which shows the location of the energy levels corresponding to the actual order (somewhat schematized) of filling of the electron shells for consecutive elements in D. I. Mendeleev’s periodic system of elements. The numbers that are to the right, near the brackets, determine the numbers of elements in the periods of this system, which are terminated by the atoms of the inert gases with external shells of the type np6 (n= 2, 3, 4, 5, 6) for Ne, Ar, Kr, Xe, and Rn (Z = 10, 18, 36, 54, 86). ENERGY LEVELS OF COMPLEX ATOMS. Each atom is characterized by a normal electron configuration (which is obtained when all the electrons in an atom are bound the most strongly) and by excited electron configurations (when one or several electrons are bound more weakly—they exist at higher energy levels). For example, for the helium atom the following excited levels are possible in addition to the normal electron configuration 1sz: 1s 2s, 1s 2p, . . . (one electron excited), 2s2, 2s 2p, ... (both electrons excited). One energy level of the entire atom corresponds to a specific electron configuration if the electron shells are filled completely (that is, the normal configuration of the Ne atom, 1s2 2s2 2p6) and a series of energy levels if there are partially filled shells (that is, the normal configuration of the N atom, 1s2 2s2 2p3, for which the 2p shell happens to be half filled). In the presence of partially filled d- and f- shells, the number of energy levels which correspond to each configuration can reach many hundreds, so that the energy-level diagram of an atom with partially filled external shells turns out to be very complex. The ground energy level of an atom is the lowest level of the normal electron configuration. Quantum transitions in the atom. In quantum transitions an atom passes from one stationary state to another and from one energy level to another. In the transition from a higher energy level (Ei) to a lower one (Ek), the atom gives up the amount of energy Ei − Ek; in the reverse transition it gains this amount. For the atom, as for any quantized system, quantum transitions can be of two types: with radiation (optical transitions) and without radiation (nonradiative or nonoptical transitions). The most important characteristic of a quantum transition is the transition probability, which defines how often this transition will occur. where h is Planck’s constant; hv is the energy of the photon. Relation (8) is the law of conservation of energy for microscopic processes which are connected with radiation. An atom in the ground state can only absorb photons, and an atom in excited states can both absorb and emit them. A free atom in the ground state can exist for an unlimited time; the duration of the atom in an excited state—the lifetime at an excited energy level—is limited, as the atom spontaneously either partially or completely loses the excitation energy, emitting a photon and passing to a lower energy level. (In addition to such spontaneous emission, forced emission—which, like absorption, occurs under the influence of photons of the same frequency—is also possible). The lifetime of an excited atom decreases as the probability of a spontaneous transition increases. For excited hydrogen atoms this time is on the order of 10”-8 sec. is obtained. For nk = 1 and ni = 2, 3, 4, 5, ... , the Lyman spectral series is obtained (the lines Lα, Lβ. Lγ, Lδ, . . .); for nk = 2 and nt = 3, 4, 5,. . . , the Balmer series (the lines Hα, Hβ, Hγ,. 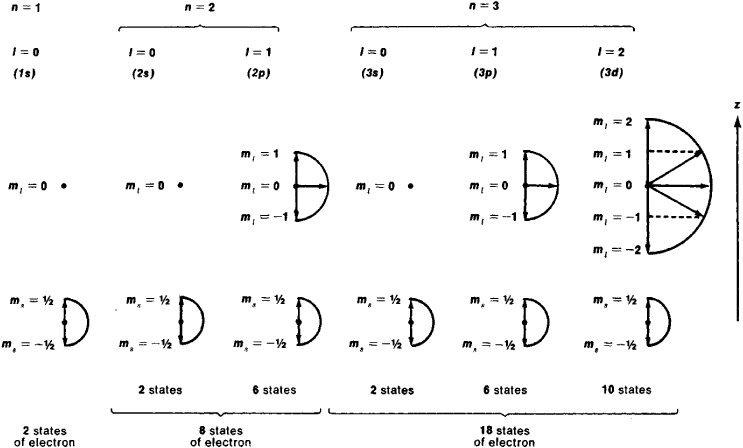 . .); and for nk − 3 and ni = 4, 5,. . . , the Paschen series (see Figure lb). For the atoms of other elements, in correspondence with a more complex energy-level diagram, an even more complex spectrum is obtained. QUANTUM TRANSITIONS WITHOUT RADIATION. In these transitions the atom gains or gives off energy by interaction with other particles with which it collides in gas or to which it is bonded for a long time in a molecule, liquid, or solid. in a gas an atom can be considered free in time intervals between collisions; during a collision (impact) the atom can, owing to the short-lived interaction, make a transition to a different energy level. Such a collision is called inelastic (in contrast to an elastic collision, in which only the kinetic energy of the atom’s translational motion is changed and its internal energy remains unchanged). An important particular case is the collision of a free atom with an electron; usually the electron moves rapidly in comparison with the atom, the time of collision is very small, and it is possible to speak of electron impact. Excitation of an atom by electron impact is one of the methods of determining the atomic energy level. The probabilities of inelastic collisions and, in particular, of excitation of an atom by electron impact can be calculated by the methods of quantum mechanics. Chemical and physical properties of the atom. The majority of properties of the atom are determined by the structure and characteristics of its outer electron shells, in which the electrons are bound comparatively weakly (binding energy varies from several eV to several dozens of eV). The structure of the inner shells of the atom, the electrons of which are bound much more strongly (binding energies in hundreds, thousands, and tens of thousands of eV), appears only in interactions of the atom with fast particles and photons of high energies (more than hundreds of eV). Such interactions determine X-ray spectra of the atom and the scattering by the atom of fast particles. The mass of the atom, which depends on the mass of its nucleus, determines the mechanical properties of the atom moving as a unit—the momentum and kinetic energy. The mechanical moments and the magnetic and electrical moments associated with them determine certain fine effects (moments of atomic nuclei, nuclear magnetic resonance, nuclear quadrupole resonance, and hyperfine structure) which appear upon investigation of the physical properties of the atom. PROPERTIES OF THE ATOM THAT ARE DETERMINED BY ITS OUTER ELECTRONS. The electrons in the atom’s outer shells, which are bound comparatively weakly, are easily influenced by external interactions. In bringing a given atom close to others, strong electrostatic interactions (including so-called exchange interactions) arise which can lead to the emergence of chemical bonds in the atoms—that is, to the establishment of molecules. The electrons of the outer shells participate in chemical bonding. In the case of covalent bonding, these electrons no longer belong to an individual atom, but rather to the whole molecule that has been formed, and enter into the composition of its molecular electron shells. Thus, the outer electrons of the atom determine its chemical properties. Weaker electrostatic interactions of two atoms appear in their mutual polarization—the displacement of the electrons with respect to the nuclei, which is strongest for the weakly bound outer electrons. There arise polarization forces of attraction between atoms which must be considered even for large distances between the atoms. The polarization of the atom also takes place in external electrical fields; as a result, the energy levels of the atom are displaced and, particularly important, the degenerate energy levels are split (the polarization is different for various atomic quantum states of the same energy). This is the Stark effect. Polarization of the atom can occur under the influence of the electrical field of a light (electromagnetic) wave; this depends on the frequency of the light wave, which in turn affects the value of the index of refraction. The latter is related to the tendency of the atom to be polarized—the polarizability of the atom. The close connection of the optical properties of an atom with its electrical properties appears particularly clearly in its optical spectra. The outer electrons also determine the magnetic properties of the atom. They are similar for elements with analogous outer electron shells. The magnetic moment of the atom depends on its mechanical moment; in an atom with completely filled electron shells, it is equal to zero, as is the mechanical moment. In the presence of partially filled outer electron shells, the magnetic moments of the atom, as a rule, are constant, and the atoms are paramagnetic. In an external magnetic field all levels of the atom in which the magnetic moment is not zero are split. All atoms exhibit diamagnetism caused by the production of a magnetic moment in them under the influence of a magnetic field (a so-called induced magnetic moment, analogous to the electric dipole moment of an atom). PROPERTIES OF THE IONIZED ATOM. In the stepwise ionization of an atom—that is, in the removal of its electrons, beginning with the outermost in order of increasing bond strength (Figure 4)—all the properties of the atom determined by its outer shell are correspondingly altered. The outer electrons become more strongly bound; as a result, the polarizability of the atom in an electric field decreases sharply, the distances between energy levels increase, and the frequency of optical transitions between these levels increases. (This leads to a shift of the spectra toward shorter and shorter wavelengths.) A number of properties reveal periodicity: the properties of ions with analogous outer electrons turn out to be similar—that is, N7+ and N3+ (one and two 2s electrons) reveal a likeness to N6+ and N5+ (one and two Is electrons). This is related to the characteristics and relative location of energy levels and to the optical spectra, the magnetic moments of the atom, and so on. The most striking change in properties occurs on the removal of the last electron from the outer shell, when only completely filled shells remain—for example, in the transition from N4+to N5+ (electron configurations Is2 2s and Is2). In this case the ion is most stable and its total mechanical and total magnetic momenta are equal to zero. Ions with completely filled outer np (n = 2, 3, 4, . . .) shells, apart from ions with the electron configuration Is2, are particularly stable. PROPERTIES OF BOUND ATOMS. The properties of atoms in a bound state—for example, those in a molecule—differ from the properties of free atoms. The greatest changes occur in atomic properties which are determined by the outermost electrons, which join one atom to another. At the same time, properties determined by the electrons of inner shells may remain practically unchanged, as is the case for X-ray spectra. Certain atomic properties may undergo comparatively small changes from which information can be obtained about the nature of the interactions of bound atoms. An important example is the splitting of atomic energy levels in crystals and complex compounds, which occurs under the influence of the electric field created by surrounding ions. A primitive data element in a data structure. The individual structure which constitutes the basic unit of any chemical element. An element, A, of a measure algebra, other than the zero element, which has the property that any element which is equal to or less than A is either equal to A or equal to the zero element. (1) (Atom) Intel x86 chips. See Intel Atom. (2) (Atom) A Web feed. See Atom syndication format. (3) A single element. See atomic. (4) A fundamental building block of matter. Atoms are microscopic solar systems that are made up of particles and mostly space. Within that space, electrons create an outer shell by circling a nucleus containing protons and neutrons of similar mass. Neutrons have no electrical charge, but protons have a positive charge. Since there are the same number of electrons as there are protons, and since electrons have a negative charge, the atom has a net charge of zero. See electron. Since the days of ancient Greece, the atom was considered "the" smallest element of matter and indivisible, which is what "atomic" means. However, in the 1960s, we discovered that the nucleus was made up of more particles, which were named quarks and leptons. Perhaps some day, we will find those particles made up of even more particles in our never ending quest to discover what we are really made of. THERE IS NO MATTER AS SUCH! All matter originates and exists only by virtue of a force which brings the particles of an atom to vibration and holds this most minute solar system of the atom together. We must assume behind this force the existence of a conscious and intelligent mind. This mind is the matrix of all matter." Indeed, 'the origin of hyperfine interactions' dates back to Nagaoka's atomic model. Bohr's atomic model which paved the way for a new generation of physics called Quantum Physics, replaces the alphabet "o" of Google on its homepage. Since a typical networked system can only be characterized as nodes and links, it is started to develop network model by specifying these basic components using parallel DEVS atomic model. We are now in the process of building an atomic model of the actin sheet dimer by fitting the atomic structure of the actin molecule (Kabsch et al. He traces many of them back to Bohr's atomic model of 1913. Nagaoka's atomic model and hyperfine interactions . Once the crystal structure is solved and the atomic model is built, we will be able to look into the details of the slipping switch mechanism. It's like having a periodic table of chemical elements without an accompanying atomic model to show why elements belong in different groups. Beyond the top: now that physicists have found the top quark, what's next? Perhaps the incoming ion and the metal surface combine to form a hybrid structure inadequately described by any present atomic model. We tried out the app ourselves and it works quite seamlessly by placing atomic models of all 118 elements from the periodic table in real space. He helped develop the first spectroscopic diagnostics for astrophysical photo-ionized plasmas, designed some of the earliest laboratory astrophysics experiments using high-power lasers, and pioneered the use of detailed atomic models for predicting energy balance in Tokamaks.